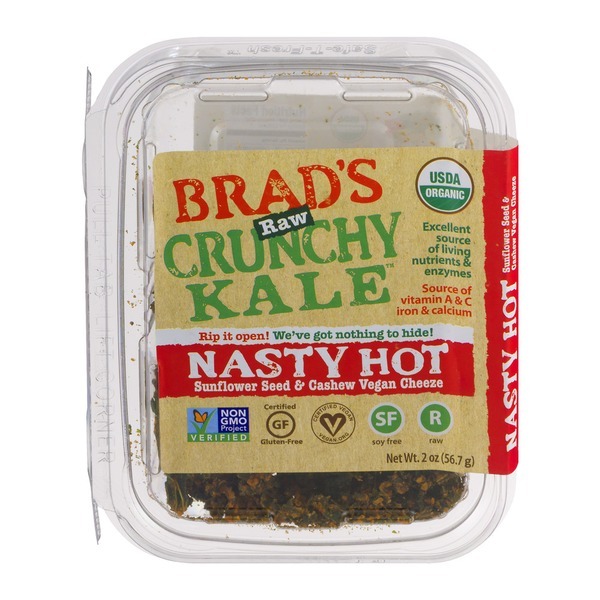 Brad's Raw Crunchy Kale™ Nasty Hot. Sunflower seed & cashew vegan cheeze. USDA Organic. Excellent source of living nutrients & enzymes. Source of vitamin A & C iron & calcium. Rip it open! We've got nothing to hide! Non GMO project. Verified. Certified GF, gluten-free. Certified vegan, vegan.org. SF soy free. R raw. **Kale, **Red Bell Peppers, **Sunflower Seeds, **Cashews, **Lemon Juice, **Chickpea Miso (Rice, Chickpeas, Sea Salt, Water, Koji Spores (Aspergillus Oryzae)), Himalayan Salt, **Jalapeno Powder, **Cayenne Powder. **Represents Organic Ingredient.